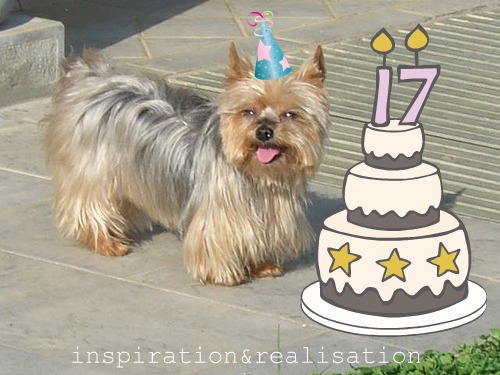 inspiration and realisation: DIY fashion blog: happy b'day gilda! I still remember the day I gave it to my mom, she was 5 weeks old and could fit in the palm of my hand. (she had a deadly breath due to several gum infections). she is almost my sister... well at least for my mom's point of view! Oh, so sweet! They become such a happy part of our lives, don't they? I have a 3 lb Chihuahua named Harriet, who just turned two. She brings me so much joy. aww she's a cutie! My dachshund Bacardi, just made 5 in august. She is so cute. Happy Birthday you cute little dog. tanti auguri alla tua Gilda! Io ho una gattina che quest'anno ha dovuto subire l'asportazione dei molari ed ero terrorizzata per via dell'anestesia totale! Per fortuna è andato tutto bene, ha tredici anni, siamo cresciute insieme e sono legatissima a lei! Happy birthday... kiss her from me!